I’ve been curious about the Miss Read books and was so pleased when Village School was lucky number #5 on my Classics Club Spin List. It tells the story of the small village of Fairacre, England, as narrated by the school mistress of the local, two-room elementary school, aka “Miss Read”. Set right after World War II, the book begins on the first day of school with all the anticipation and excitement felt by the two teachers and their students. The story unwinds in a series of slice-of-life vignettes that follow the school year. 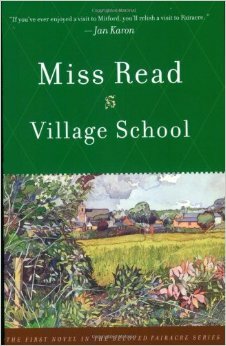 Miss Read has a knack for creating evanescent moments: children making straw bunches for the harvest festival; strained conversation while drinking tea in a dusty sitting room; an evening of skating on the local pond lit up by a farmer’s lorry (truck) headlights. The author, whose real name is Dora Jessie Saint, taught school for many years, and the Fairacre novels are fictionalizations of her own experiences—much like James Herriot’s books. Village School is a delightful, cosy, and relaxed read. That’s not to say that it is sugar-coated. The thatched cottages look pretty, but inside they are dark and damp, with no plumbing or drainage. Likewise the narrative touches on difficulties such as a drunkard father, a boy who has no dinner (lunch) money, and the formidable test that decides the educational fate of 11-year-olds. Miss Read empathizes with her students and neighbors, especially the grubby but beguiling Joseph Coggs. Overall, however, the book is upbeat and highlights the charm of village life. The school janitor (who has laid out all the courses) has a role of prominence at the summer sports day, walking about in a blue serge suit with the vicar. My one serious complaint is that the “n-word” jumped off page 135, which was shocking and, honestly, somewhat horrifying. Miss Read uses it to describe how hard one of her students is studying. This was especially jarring given the comforting cadence of the prose. Back in 1939, Agatha Christie had a book with the “n-word” in its title, although when it was released the next year in the U.S., the title was changed to And Then There Were None. The UK version adopted the latter title by the 1980s. Village School was published in 1955, and my edition was reissued in 2001. So it seems even more egregious that this has not been addressed. That aside, I found this a charming book, and I think the many Fairacre sequels will be perfect reading for cold winter nights by the fire with a cup of tea. To read other reviews from this CC Spin, check out @ourclassicsclub or #ccspin on twitter. Why not join us in the next Classics Club Spin? It can be challenging to read books from another time when racist, sexist, ageist comments or opinions creep in. I had a similar experience with Gone With the Wind recently. Some of Mitchell’s attitude towards the slaves wasn’t easy to read now. But it did reflect the prevailing attitudes of the times. It makes me wonder what attitudes or words will be rejected as being wrong, immoral, unethical in our current books by future readers? It is interesting to wonder about things we may be accustomed to that might cause offense to future readers. Hmmmmm.